The concept of a “soul” independent of the physical body is what led to immaculate mausoleums and funeral traditions. Most believers envision this “soul” to be in the body while a person is alive; when a person passes away, the immortal soul “escapes” and continues a disembodied “life” in the netherworld. In other words, the soul is the part of us which survives the death of the body; and the soul is perfectly capable of experiencing happiness or misery in this future state. These pages will not entertain a discussion of whether or not there is a soul. Mark Twain had his own skeptic angle on this: "One of the proofs of the immortality of the soul is that myriads have believed it -they also believed the world was flat." Mark Twain's humor aside, this subject has many proponents and opponents. Be my guest and Google the concept of soul; you’ll get some 5 million hits! Historically, the general belief held that the soul of the deceased would be able to influence the life of the living. It was therefore a good idea to accommodate the deceased in the hope that he or she would bring good fortunes to those still living outside the netherworld. The fengshui theory holds that positive and good energy will form when a person is buried underground because of a natural combination between the tomb location and the dead spirit. This energy will not only benefit the deceased but also the whole family. And in the case of an imperial tomb then the energy is vital for the entire nation. The burial is generally believed to bring peace to the deceased. And now we are nearing the topic at hand: Mausoleums (or in good Latin: Mausolea). Not only was the tomb the place where the deceased passed into the netherworld but it was also where the deceased took up afterlife “residence”. This explains why the layout and design of mausoleums imitated the earthly living quarters of the deceased person. The layout of the underground palace of Dingling tomb for instance is a copy of the temples of The Forbidden City where the deceased used to live while emperor in “The Middle Kingdom”. What to bring on the long journey? It was important for the deceased to bring all the necessary things for daily life after death. On the other hand, if not robbed or opened before, some tombs today give an invaluable insight into the life and culture of past generations. But the "daily necessities" sometimes went far beyond mere artwork and food. Consider the tomb of China’s first emperor, Qin Shi Huang (reigned 221-210 BC). He built a yet unopened tomb with heaven, earth and water imitations inside. And for eternal protection he took his entire administration and army with him, the latter in the shape of the famous terra cotta figures in Xi’an. The less glamorous and cruel part was the offering of human lives. In the early days, human slaves were a mere personal property that was sacrificed to serve the deceased in the afterlife. This custom died out in China already a couple of millenniums ago; not so much for humane reasons but simply because slaves were too expensive. Qin Shi Huang’s terra cotta figures were excellent examples of a substitute for human sacrifice. Some Ming emperors however still insisted on taking their favorite concubines with them. Human offerings have been found at Xianling, Changling and Jingling of the Ming tombs. The concubines were normally not buried in the main vault but in separate “wells” nearby. Adding to the cruelty, they were buried alive in a standing position awaiting their emperor in the netherworld. Whereas the concept and belief in a soul remained unchanged, the design of Chinese feudal tombs developed over time. 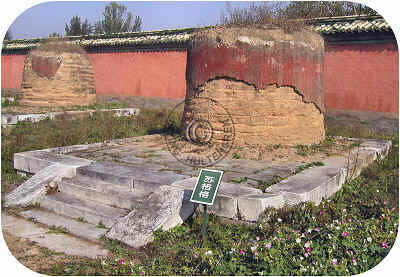 Earlier tombs beginning with the Qin dynasty (221-207 BC) and until the Tang dynasty (AD 618-907) followed a square design. Later and ancillary dynasties used large, chimney-like, round earth mounds. The Ming dynasty (1368-1644) broke the tradition by implementing an entire new mausoleum design. 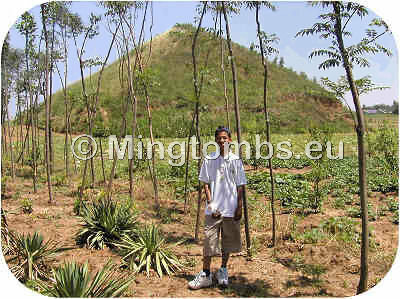 The tomb mound was round or oval; in front of the mound were a number of well-regimented structures each one with its own, specific purpose, all arranged in square or rectangular settings. The front part corresponded to the front court for official business in the imperial palace; the rear part was for the emperor’s living quarters. The Forbidden City of Beijing follows the same principles. 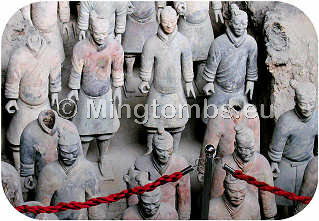 Qing tomb, Qingxiling - a copy of Ming tombs? Twice a year the ruling emperor with a large following would pay a visit to the mausoleum of his ancestors. The visit entailed a complex set of sacrificial rites, which developed and were refined over the years. The subsequent and last Chinese dynasty, the Qing (1644-1911), by and large copied the Ming mausoleum layout. They also assumed the veneration rites, although they added some of their own from Manchuria, their homeland. 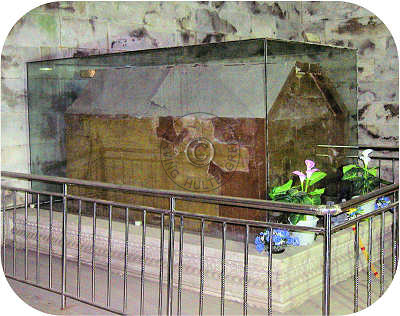 The general tomb layout, structure and rites are described elsewhere on these web pages. 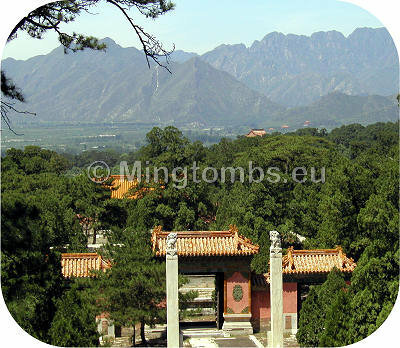 Ming Tombs - A New Concept? The Ming appear to have significantly changed perception of the function of the tomb. Before the Ming great emphasis was placed on creating an underground "home" for the deceased to go on "living". Burial chambers were spacious and walls decorated with murals. Large amounts of burial items "necessary for living" were entombed with the deceased. Food, beverages and utensils were essential. In contrast, the Ming mostly discontinued the use of murals and similar decorations. The chambers were generally made smaller and the number of burial items decreased. The Ming appeared far more concerned with the preservation of the corpse than in previous dynasties. Caskets were better sealed to prevent insects and water from reaching the corpse and ever increasing efforts were made to create efficient drainage systems so as to keep the burial chambers dry. The Ming thus viewed the tomb more as a place to maintain a connection over "the divide" between the living and the deceased and hence more efforts on protection and preservation. The entire new mausoleum layout starting with Xiaoling, the mausoleum of the first Ming Emperor, and later refined and standardized in most of the subsequent Ming imperial mausolea served the purpose of ancestor veneration -even including the presence of slaughterhouses to ensure freshly cut meat. The living were no longer worried that unhappy deceased would return to haunt them. Instead they wanted to create and maintain an emotional bond with the deceased and to treasure the memory of same. Nowadays, we may all be crawling over the Ming tombs that are open to the public and marvel at the great workmanship of the structures. But these burial grounds are still highly respected ancestral shrines –both by Chinese rulers and common people. The tombs were heavily guarded in feudal times and only those with an official purpose and with proper papers could go anywhere near the areas. This protection deteriorated in the early days of the republic when among others the tomb of Empress Dowager Cixi was desecrated by warlords. Cixi was the “Dragon Lady”, who ruled from behind the curtain in the late part of the Qing dynasty. The last Chinese emperor, Puyi, was quite distraught when he learned of the violation of his ancestors’ tombs. Allegedly, this strengthened his resolve to reestablish his lost Qing dynasty. Today, only four Ming tombs are open to the general public: Xiaoling in Nanjing and Changling, Dingling and Jingling, all north of Beijing. The Ming implemented yet another new approach. Hitherto deceased emperors were entombed each in their own grand mausoleum not too far from the imperial capital -if not outright within its city walls. Commencing with the Ming, burial took place in a tomb far away from the domicile of the ruling emperor and these tombs were all located within the same imperial cemetery. The first Ming Emperor Zhu Yuanzhang (r. 1368-1398) chose the "Purple Mountain" east of the capital, Nanjing, as imperial burial ground and interred his Empress Ma and his son there. In turn he himself was buried there in the year 1398. The second Ming emperor allegedly perished in a fire and we do not know where he is buried. When the third Ming Emperor Yongle (reign 1402-25) moved the capital from Nanjing to Beijing he realized the importance of also finding a new, perfect cemetery for all future Ming emperors. Adding to the urgency, his wife, the Empress Xu, had passed away in 1407 before Yongle had commenced the move north. She was only buried in a temporary grave in Nanjing so Yongle immediately sent his officials into the area surrounding Beijing in order to identify the perfect geomantic location for the future Ming dynasty cemetery. The location could not be too far away from the imperial capital as it would otherwise be inconvenient to visit the spirits of the deceased and pay respect. In the end he chose a location some 50 kilometers north of Beijing, near the city of Changping. In Ming days it took the emperor and his entourage some three days to get there from Beijing. Today we make the same journey in about an hour by car. 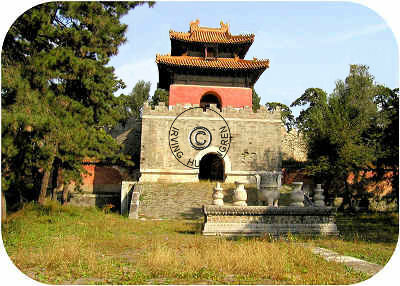 The Chinese refer to the area as "Shisanling", meaning "The Thirteen Tombs", because 13 Ming emperors are interred here. The entire area was protected by a 40 kilometer wall, which had ten gates: Zhongshan, Dongshan, Laojuntang, Xianzhuang, Hulling, Zhuishi, Yanzi, Desheng, Xishan and Zhazi, each with a fortress guarded by imperial troops. 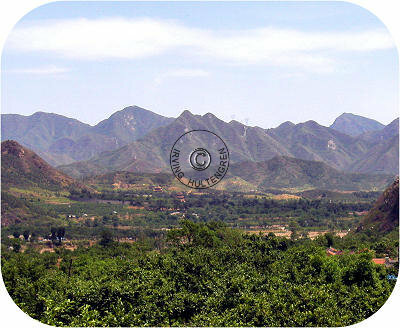 Ming Shisanling covers an area of 120 square kilometers. The subsequent Qing dynasty (1644-1911) similarly chose not one, but two imperial cemeteries near Beijing, the Eastern Qing Tombs ("Qingdongling") and the Western Qing Tombs ("Qingxiling"). Both are some 125 kilometers away from Beijing -approximately a three hour long car ride, but well worth it for those interested in imperial mausoleum architecture. 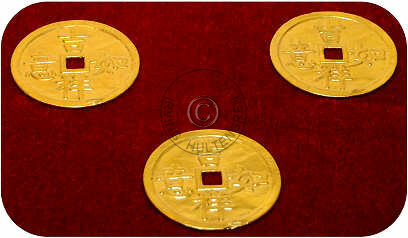 Only one Qing emperor was not interred with his forefathers in either of the two Qing cemeteries. The last Qing emperor, Puyi (r. 1908-11), was at first buried in a Beijing military cemetery but moved to a new grave late in the last century. 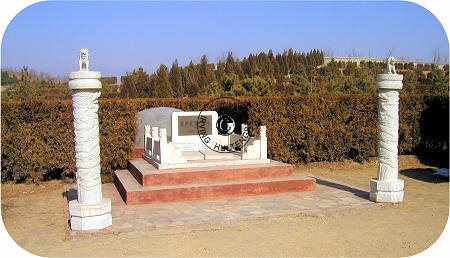 His grave is located on a hill in a private cemetery not far from the borders of Qingxiling. His tomb is simple and has none of the splendor which we associate with a Chinese imperial mausoleum. By the way, it is hard to find.